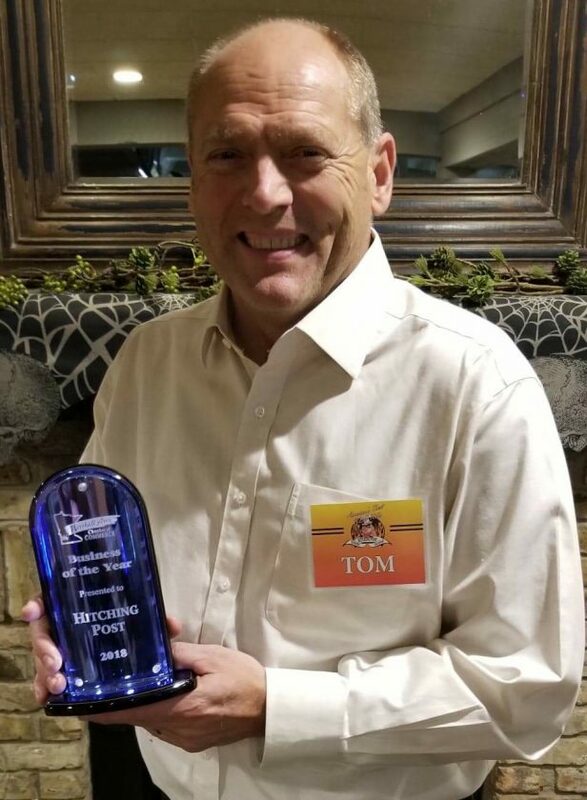 Submitted photo Tom Handeland, owner of the Hitching Post restaurant in Marshall holds his Marshall Area Chamber of Commerce Business of the Year award for 2018. MARSHALL — The 1990s commercial expansion south of the Minnesota Highway 23 bypass in Marshall during the 1990s included a new lease on life for an existing restaurant building, now the site of The Hitching Post Eatery and Saloon. After success in a variety of restaurant and food service ventures, Hitching Post owner Tom Handeland spotted an opportunity to establish a supper club style restaurant at Marshall’s former Country Kitchen. He launched the Hitching Post in 2003. Its long-term success was recognized by the Marshall Area Chamber of Commerce through its Business of the Year award for 2018. One of Handeland’s prior business projects involved the creation of his own sandwich franchise based out of Granite Falls in the early 1990s, which was called Fatso’s. He has also managed restaurant and clubhouse services located at golf clubs. 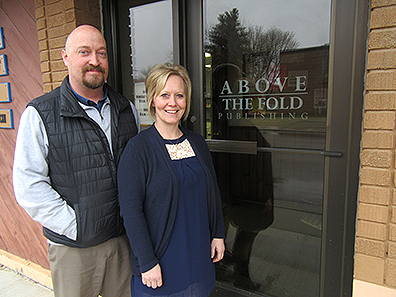 He chose to work toward the Hitching Post after hearing from a friend who felt the building’s location and Marshall’s economic growth added up to an “opportunity of a lifetime”. Several other friends had a different point of view based on the turnover in ownership since Country Kitchen, as well as the likely up-front costs for remodeling. Country Kitchen established its Marshall location in the 1970s, when the restaurant chain grew to include much of the middle third of the United States. It was joined less than 10 years later by Marshall’s Perkins restaurant at the corner of East Main St. and East Southview Drive. 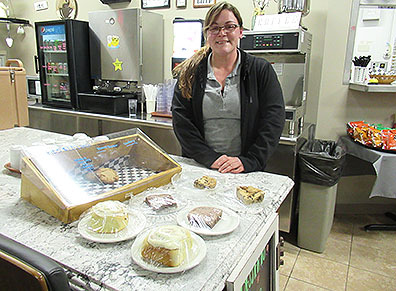 Country Kitchen eliminated its Marshall site several years later as part of a national downsizing process. The location was then home to Aunt Nellie’s, Crossroads and lastly a DeToy’s restaurant. Commercial development that began with the early to mid 1990s establishment of Wal-Mart and Shopko accelerated at about the same time Handeland started the Hitching Post. The area now includes businesses such as Aldi, Menard’s, Pizza Ranch, Tallgrass Liquor, Running’s, Cold Stone Creamery, Culver’s, and the locally-founded Skewes Jewelry. At the same time, Marshall School District voters approved a bond issue for a new Marshall High School across Highway 23 from Southwest Minnesota State University. Crowds who’ve attended events at the sports and arts facilities on the high school campus have created a new group of potential customers. He added that other restaurant operations have also looked for ways to capitalize on Marshall’s overall economic activity. Hitching Post offers a menu highlighted by a combination of steak, ribs, shrimp, walleye, chicken, pasta, and sandwiches. A main goal is to offer food that’s prepared on site rather than pre-packaged. A selection that proved especially distinctive is the Hitching Post ribs. Handeland said the process of creating any recipe that gains a positive image for consistency, flavor, tenderness or a combination of all three qualities amounts to a culinary art and a carefully kept secret. He said atmosphere is another important consideration for any full-service, sit-down restaurant. For the Hitching Post, he reinforced the chosen name with a wide assortment of furnishings based on Western themes. It lends itself to serving families with children along with adult customers. Substantial changes to the facility have been made since 2003. One is the construction of a large patio in an area that was originally just a lawn with a split-rail fence. Another update involved a reconstructed entrance. Instead of the Country Kitchen style entrance that branched off two ways into smoking and non-smoking areas, Handeland chose a plan for traffic flow based on an entrance that winds past the smaller seating area toward the counter, more extensive booth and table seating and then the slightily more formal dining section. Marshall Area Chamber of Commerce President Brad Gruhot said Handeland was an excellent candidate for the Business of the Year Award because of the continuous way he strives to make the most out of every potential opportunity to enhance his operations. “Tom is the kind of entrepreneur who never stops thinking about ways he might be able to improve his business,” Gruhot said.